Tuholski Farms Inc. is a large family farm located in Mill Creek, and La Porte High School is home to two members of the family. Mr. and Mrs. Tuholski, both teachers at LPHS, are part-time farmers who contribute to the family business. 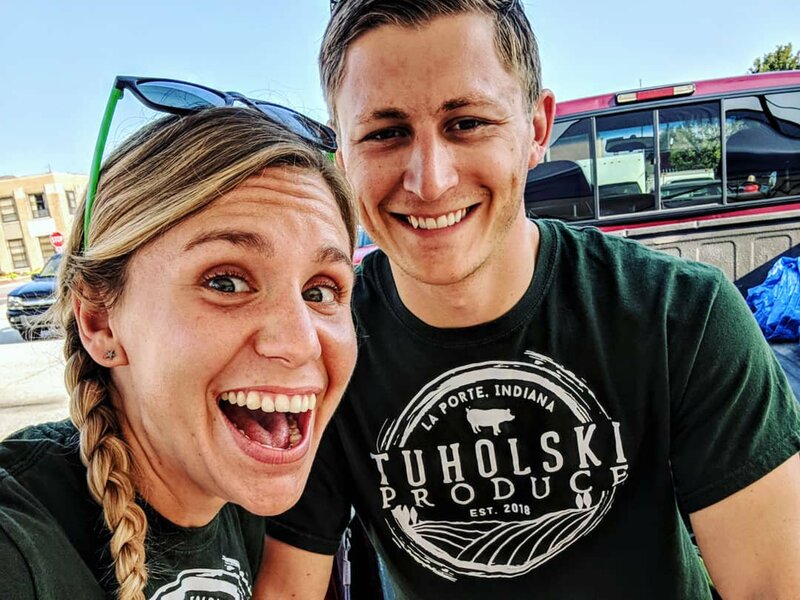 Mr. Tuholski has a lot on his plate with having a full-time job as a teacher and working on the farm as well as running Tuholski Produce. “Sixty-hour work weeks are the norm from spring through fall,” Tuholski said. Mrs. Tuholski teaches the food lab classes at LPHS, also helps around the farm, and has to adjust her work life to her farm schedule. “It definitely makes life busy. I would like to integrate my class and farming in the future and teach my students about the farm and how it relates to food,” Mrs. Tuholski, said. Mr. Tuholski copes with his busy schedule by making his lesson plans weeks and even months in advance. Farm work can’t wait, so it is important for him to have his school schedule ready ahead of time. Succeeding in a small business comes along with lots of paperwork, note-taking, etc., and it is crucial to stay organized to manage the load. Farming runs throughout the family and all started from his great-grandparents. Mr. Tuholski’s great-grandparents were farmers who came to America from Poland. They settled in La Porte and the family has been farming here since. The family’s history of farming has influenced Mr. Tuholski and given him an interest in it as well. “I inherited a love of gardening from my grandparents on both sides. My maternal grandparents loved to work in the garden together in their retirement and my grandpa loved to brag about how I helped him fertilize his garden one fall and the next year his pumpkins were bigger than they had been in years,” Tuholski said. Tuholski Farms offers a variety of fruits and vegetables but has plans to make other additions as well. This year’s focal point was mainly on vegetables and fruits grown at the garden. They have a small orchard consisting of pears and apples that are expected to be sold in the market next year. Next year, they would like to buy hogs to offer whole and half hog orders to their consumers. Tuholski Farms is bringing in new forms of farming as well. This fall they are set to build a greenhouse and hope to incorporate various hydroponics and aquaponics units for year-round production. Mrs. Tuholski has a goal of combining her knowledge of farming and incorporating that knowledge into her food labs class. Farm to School is a grant she is looking into that would bring the idea of local food into the school and integrate it into classes. The Tuholski’s are upholding the family business and carrying out traditions. They are compassionate about farming and enjoy providing to the community. “[What I enjoy most is] the fact that I get to supply people with local food and people who might not have access to fresh food,” Mrs. Tuholski, said. Anyone interested in purchasing their produce can find them at the La Porte Farmers Market.